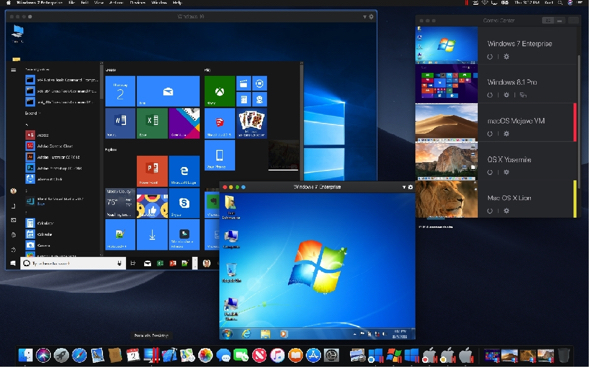 Parallels, a global leader in cross-platform solutions and creator of the #1-selling software for running Windows applications on a Mac, today launched Parallels Desktop 14 for Mac, which provides macOS Mojave–readiness. Upgrading to Parallels Desktop 14 offers significant storage savings, faster launch times, improved graphics and the latest versions of Parallels Toolbox for Windows or Mac. Through Parallels Desktop 14, customers now have access to more Windows features on Mac than ever before. • Smart card readers are now automatically available in both Mac and Windows for faster access (if enabled). • Replace existing virtual machines in Deployment Mode to streamline productivity. • Applications deployed in the Single Application mode start faster, along with a new modern-looking splash screen. • Screenshot Page – Capture and print lengthy webpages that don’t fit onto your screen. Take and print screenshots of webpages in one click—even pages longer than your browser screen. • Free Memory – Reclaim RAM memory and optimize its consumption on your Mac. Add this Free Memory tool to the macOS menu bar to easily check how much RAM is available with just a click and reclaim available memory. • Resize Images – Batch convert images to your desired file size and format. Simply drag the source images to the tool’s window, specify the desired dimensions/size and output location, and click. Today, Parallels Desktop 14 for Mac, Parallels Desktop 14 for Mac Pro Edition and Parallels Desktop for Mac Business Edition are available for subscribers and upgraders from Parallels Desktop 12 and 13, as well as new customers, online at parallels.com/desktop and at local retail and online stores worldwide. Free 14-day full-featured trials are also available for download. The recommended retail price of Parallels Desktop 14 for Mac is US$79.99 for an annual subscription or US$99.99 for a perpetual license. Parallels Desktop for Mac Pro Edition and Business Edition are each available to new customers for US$99.99 per year. Parallels Desktop 12 and 13 perpetual license customers can upgrade to Parallels Desktop 14 for US$49.99, or upgrade to a Parallels Desktop for Mac Pro Edition subscription for US$49.99 per year. Parallels Desktop subscriptions include a complimentary concurrent subscription to Parallels Toolbox for Mac or Windows, as well as Parallels Access. MacDailyNews Take: If you’re going to pollute your mac with Windows, Parallels Desktop 14 is the way to do it! So using Parallels to run Windows on a Mac – does it allow for the use of all processors available and get the full power of the Mac’s components? Years ago it didn’t but things might’ve changed. Been a long time since I used it. I can’t answer about use of all processors and all of that, but I know it works a lot better than it did a few years ago, I am talking about version 13. I need it for testing websites that I develop, and because the school system I am contracted to allows Mac’s but there are some functionalities in their site and in the services that they contract that just will not function on Mac. There is no point in arguing with them on it. They have some functions that still require Internet Explorer and I am not going to go all kamikaze on the point. I leave Parallels on in the background and it causes no problems. 2015 iMac Fusion Drive 8 gb. Yes. You can assign as many processors as you want and RAM. On a 5K iMac I can assign up to 8 CPU’s (4 dual cores). I was showing 4 right now. I just changed it to 2 since I don’t need that much power in Windows right now. 270 GB…..very slow download. But I have uploaded a lot of stuff in the last 24 hours, maybe Dish is punishing me. Mine was 200MB and took about 30 seconds on a 100Mbps cable modem connection. right, mis-read, its 270 mb but I am on 12mb per second. going to be overr 3 hours when done. They MUST be throttling you or something else is wrong. 12Mbits/sec is still about 1.5Mbytes per second which should be 3 minutes. I only upgrade whenever the older version absolutely won’t support the new Mac OSX (and it actually crashes, as opposed to “may have performance problems”). Parallels upgrades are a joke. If I absolutely didn’t need Windows (and if Parallels wasn’t a whole lot better than other solutions) I wouldn’t bother upgrading at all — they’re $49.95 “pseudo-subscription” cost is a bit high (on the plus side, unlike a true subscription I can continue using the older version as long as I don’t upgrade Mac OS too many times). I’ve got 13. I usually upgrade every other year. I’ll be skipping this one. This looks like a really good reason to drop 50 bucks. Faster and leaner (OK, I know that’s probably oxymoronic as it relates to WIndows, but…) I’ll be upgrading my copy of Parallels. I had bought version 13 two months ago and had problems with DirectX 11 support (Unreal engine). I will update and see if things have improved..
Parallels 14 opened at 6 seconds and Windows 10 was open by 42 seconds (again overall). I was really surprised how fast Win-7 was up and running on my laptop and a little disappointed it took longer for Win-10 to load on my desktop. Not sure if Mojave handles the process better since it is on a older/slower computer or if Windows 10 is slower to load than Windows 7. Anyhow the startup times are shockingly quick.